Due to its proximity to my daughter's dance studio, Table 6 and I have enjoyed a long and happy relationship. Serving as an unofficial "waiting room" for unplanned time between rehearsals, I can occasionally be found there sipping a glass of wine while checking e-mails, catching up on the news, or, let's face it, playing Candy Crush. Don't get me wrong. The studio has a perfectly lovely waiting area. But they don't serve wine. So I was caught off-guard when a friend recently asked me how I liked their food. I was surprised to admit that I didn't actually know. Aside from the occasional bar snack, I had never ordered off the menu. Weird, right? 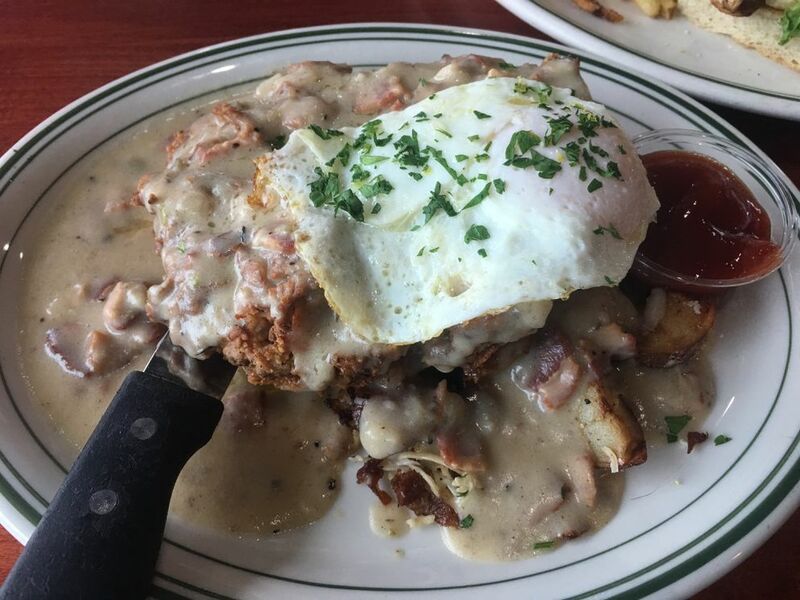 Especially since I favorably reviewed their upscale (but downtown) sister-restaurant, Haute Quarter Grille when it opened several years ago. So I decided to make up for the oversight. I grabbed my daughter (still in her dance skirt) and headed over for dinner. Instead of perching on bar stools, we hunkered down into a booth determined to eat, drink and be merry. It's a quirky room. A gleaming bar dominates and divides the space into a sit-down dining area and a more casual bar side. The first impression is of a modern, upscale-casual, rather grown-up space. But then you notice other … details. 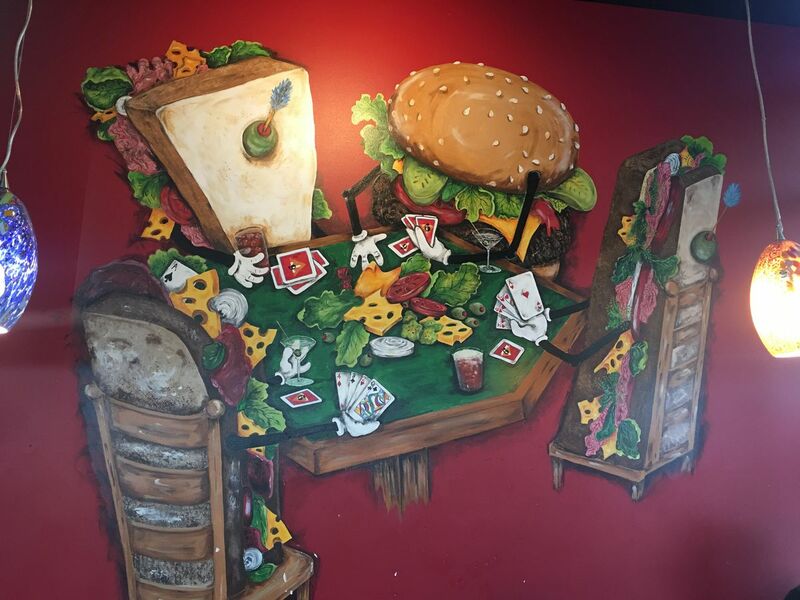 By which I mean the murals: Giant sandwiches playing poker, a potentially disturbing triptych of farm animals at a dinner table, a Tabasco airplane with bacon wings coming in for a landing being guided by a fried egg. These murals are bonkers. I love them. The menu is contemporary American – mostly pubby favorites like burgers, sandwiches, salads and pastas – with a few fun twists like curry, shrimp and grits, peanut/tofu stir-fry, and chicharrons. 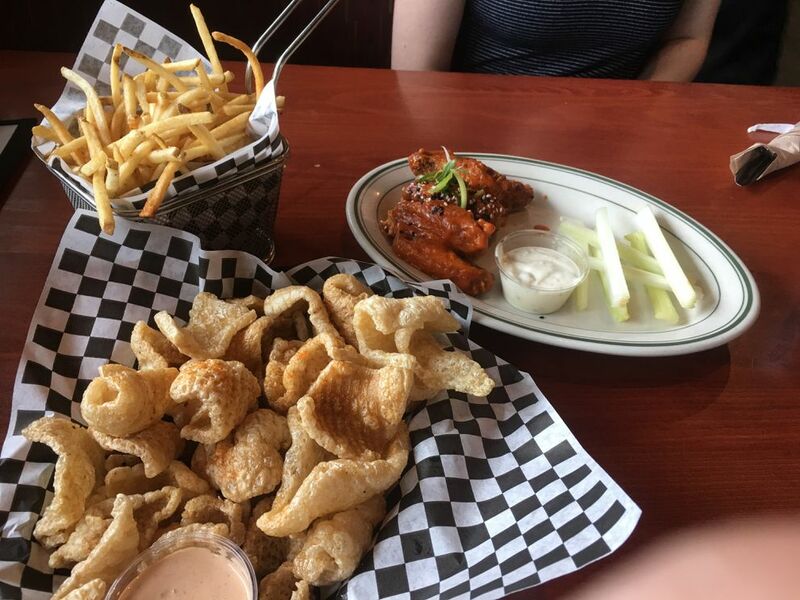 The chicharrons ($6) were clearly making it onto our table and we also decided to share an order of chicken wings ($12) and a basket of fries ($4) because … fries. I'm generally a skeptic when it comes to chicken wings in restaurants that don't have the word "wings" in their name (or at least a wing-based pun). But my daughter was craving them and I'm glad she was. These were crispy under a generous glaze of a tangy, vinegar-forward sauce. We were quick to polish these off. That said, the plating was a tiny bit sad. The wings were accompanied by a very meager pile of celery sticks. I wanted more celery – words I never, ever thought I would type. We used the very excellent fries – thin, crisp, and perfectly salted – to mop up the rest of the sauce and the ranch dressing. We're like MacGyver that way. We then turned our attention to the chicharrons (fried pork rinds) which arrived at the table still crackling and popping from the fryer. My daughter, at first, was leery. I tried to describe them as a cross between shrimp toast and Cheetos. But with pork. This, apparently, was not reassuring. But as I tucked into these crispy little puffs of savory, salty goodness, she was tempted by their sheer crunchiness. She tried one and then another and then decided she loved them. This addictive snack is seasoned with a chili lime salt and, while I had already ordered a glass of red wine, I started to crave a margarita. Oh well. Next time. 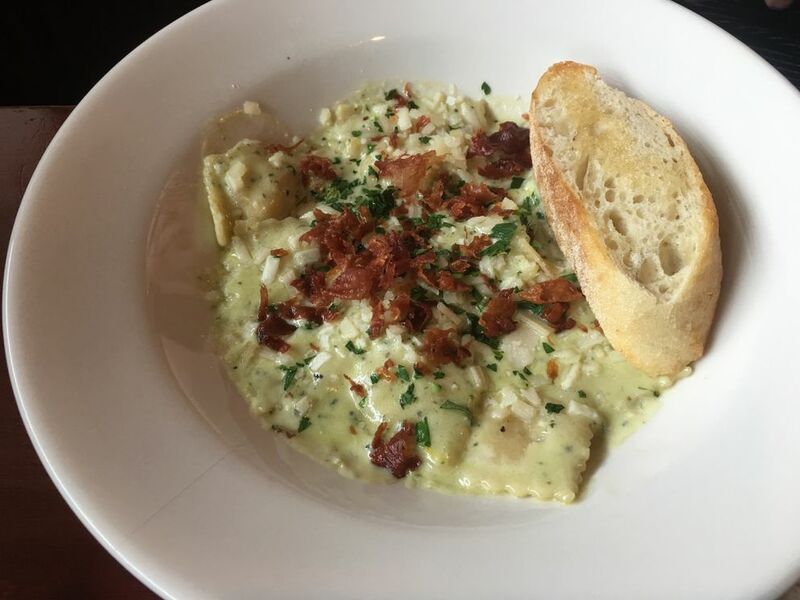 For her main course, my daughter opted for the cheese ravioli ($16) served with a pesto cream sauce. This was an extremely decadent and satisfying dish. I particularly loved the fried prosciutto that made for a lovely, crispy, salty garnish on top. I chose the shrimp and grits ($19). 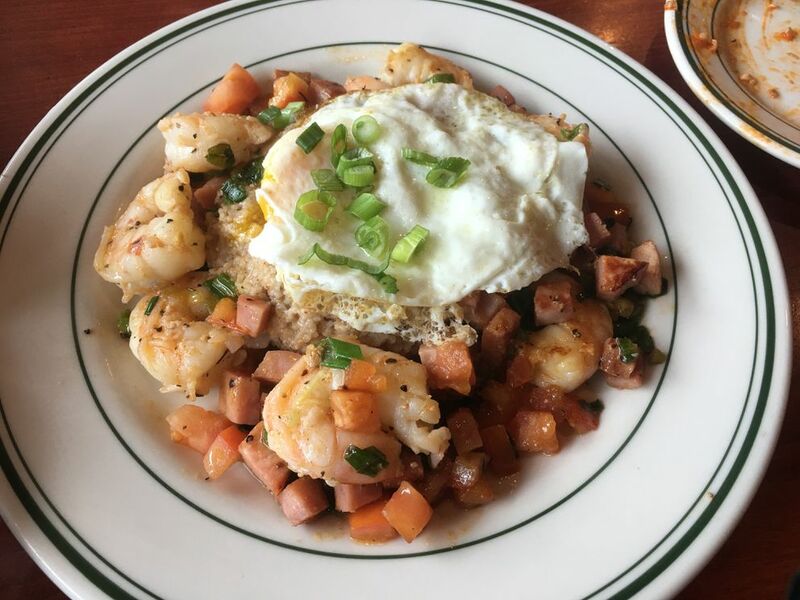 Sweet, plump shrimp were sautéed in Cajun seasoned butter and served on a bed of Alaska barley grits with ham, green onions, tomato and a fried egg. This dish was almost too rich. The tomatoes were the perfect bright, acidic balance to the salty and buttery elements on the plate, but I would have liked four times as many. I liked everything on the plate but was looking for more freshness to lighten up the dish's overall heaviness. I returned with my husband later in the week for Sunday brunch. My husband ordered the Two Handed CBLTA sandwich; I opted for the chicken fried steak ($16). 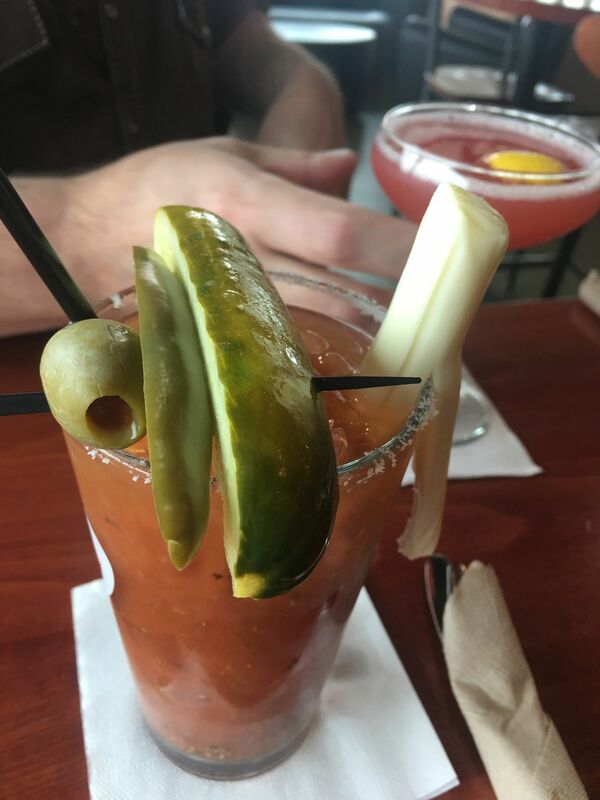 I also ordered a Bloody Mary. The sandwich was disappointing. While the menu jokingly calls this a "two handed" sandwich, it really is legitimately difficult to eat. 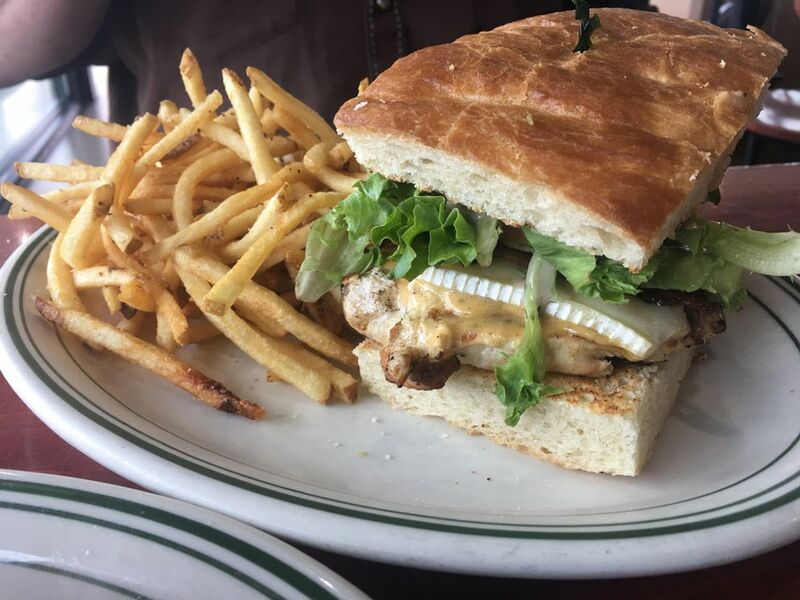 The chicken is a thick, unsliced chicken breast filet, and it's difficult to bite through. We had to dismantle the whole thing in order to get all of the flavors into one bite. The chicken is bland by itself, so it really needed the brie cheese, the Dijon mayonnaise, the bacon and the greens to be a dish worth talking about. That said, it's an easy fix. Simply slicing the chicken could turn this dish into a winner. My chicken fried steak was much more successful. The beef was tender, the batter was crispy, the gravy was rich, creamy and studded with bacon. It was, let's face it, a heart attack on a plate. But who wants to live forever? The Bloody Mary was the perfect foil for the richness of the steak. I'm already on the record declaring Table 6's Bloody Mary to be one of the best in town. Spicy, tangy and zesty, it is amusingly and appetizingly garnished with pickled jalapeno, a dill pickle, a lime wedge and – adorably – a piece of string cheese. A word about the seasoning: I didn't reach for the salt shaker once over the course of two meals, which is rare for me – a self-confessed salt-tooth. I found everything confidently and boldly seasoned. When I made note of this to my daughter, she wisely pointed out that this might mean, "It's too salty for some." Table 6 boasts an ease and versatility that I think a lot of restaurants aim for (and often miss). A casual yet polished atmosphere, classic yet creative food and friendly, professional service make it well suited for a first date, a family meal, a crowd enjoying happy hour or a solitary sipper who wants to watch the game. It's a great neighborhood joint – even if it's not your neighborhood. Hours: 11 a.m.-10 p.m. Mon.-Thurs., 11 a.m.-11 p.m. Fri.-Sat., Brunch 11 a.m.-2 p.m. Sat. and Sun. Mara Severin is a food writer who reviews restaurants in Southcentral Alaska. Want to respond to a column or suggest a restaurant for review? Reach her at dining@adn.com.